I enjoyed the hell out of this book. It’s written in a readable, light novel style that has compelling characters and plot. 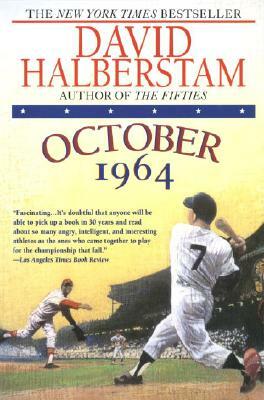 It takes you through the 1964 season, which was the end of the greatest of the Yankees dynasties. Made me think of the currently collapsing Yankees dynasty. There are 4 things I really liked about this book, and 1 thing I loved. Mickey Mantle once hit a home run that was 595 feet – which is actually TWO home runs in many parks. His entire career he wanted to hit one out of Yankees stadium (he once came close – which is unimaginable). The dozens of ingenious ways Whitey Ford would cheat to scuff up the ball. The awesome, dark rage of Bob Gibson (who I think is the best pitcher in history). Imagine the angriest person you’ve ever worked with in the worst mood possible. That was Bob Gibson pitching to you. Learning about Buck O’Neil (first black scout in major leagues – I’ll probably write a blog just about this guy). Someone really worth looking up to. I handed up this section of the book to my leadership team at work. But the thing I loved most: This is a perfect gift for my father-in-law — and picking gifts for him is hard. Here’s the deal – my father-in-law is a real-deal baseball fan. He grew up in St. Louis and legitimately roots for the Cardinals. We went to a game last summer together, which was terrific. So I figure this can supplement his baseball facts. He’s SUPER smart. He’s a Phd Biologist who headed up a lab involved in the human genome project. He wrote some of the foundational computer programs for gene mapping. It’s crazy when you google the man. This book is something he’ll really enjoy reading. He’ll love a story of his Cardinals triumphing over my Yanks. Plus it will help him a little in the Cardinals fact department too. Very glad you introduced them — the result is something I like a lot. We’ve been to a bunch of ball games together, which is something really fun for all of us. You better watch out, Mike Nuckols! I anticipate a Baseball Trivia smackdown sometime soon. 🙂 Seriously, on one of Mom and Dad’s next trips up, we should figure out a way to get down to Baltimore or even just up to a Thunder game. Nothing the boys (especially Jack) like more than baseball with Dad and Pop-Pop! Mike, I’m up for all of the above. With regard to Halberstam’s book, I’m anxious to learn more and await further instructions! You should know that 1964 was my senior year in college and that Mom and I and Judy (Chasnoff) Smith had very busy social schedules. Well please don’t get the book for yourself. Then I’m back to having no idea what to buy you as a gift. Buck O’Neil! He used to come by the art museum in Kansas City when I worked there, and his smile was infectious. Getting a hug from him is one of my favorite memories and will be treasured forever. WOW! Who is this? That’s amazing. JJ went to Rice with me. She’s one of the people who got me up to speed on school gardens. And from FB, i know she’s majorly into biking!! Thanks for following all this, JJ! Great stuff. Silly question, but…did you ever watch the ‘Baseball’ documentary? Features a ton of Buck O’Neil commentary, and great clips of Bob Gibson. I’ve met the man, and he’s still full of piss and vinegar (as you’ll recall, Mike I’m a baseball autograph junkie). Whitey scuffed the ball every which way you can, especially with his wedding ring, not to mention had his catcher Elston Howard (and probably Yogi) sharpen the rivets on his catcher’s mitt. One of the all time great, but not as well known Berra quotes…when he was a kid one of his teachers asked him, “Don’t you know anything?” He replied, “I don’t even suspect anything.” Classic. I have not watched the entire documentary. I hurt my back and watched the first few, but it’s tough to find time to watch something without my kids or wife. Awesome you met Gibson. You’re lucky he didn’t take your bat and hit you with it.